SARKAR Vs TN SARKAR Trending On Internet !! Effect Of ADMK Protest Against SARKAR !! 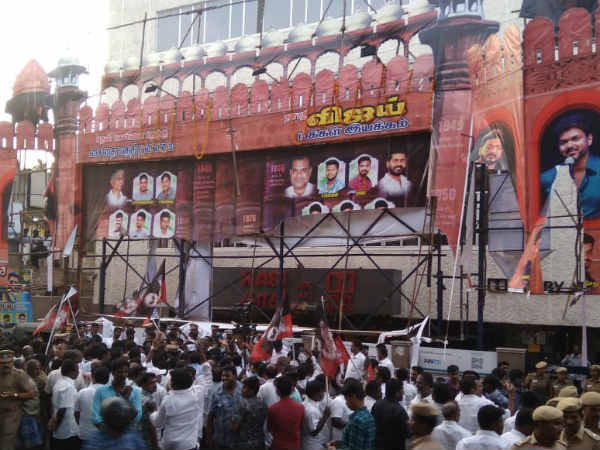 In Coimbatore, AIADMK cadre indulged in tearing down posters and banners of actor Vijay at a cinema near the city’s railway station. AIADMK spokesperson and Fisheries Minister D Jayakumar told reporters in Chennai: “This is an attempt of self-aggrandisement, and there is an attempt to storm into politics like the way MG Ramachandran did. That will never happen,” adding that the government will take action against the makers of the movie, seconding an earlier statement of Law Minister C. Ve. Shanmugham. Questions have also risen to the selective criticism of AIADMK leader J Jayalalithaa and her freebie introductions such as mixies and grinders. AIADMK leaders argue that J Jayalalithaa had expanded the list of items distributed freely to the economically depressed class of the electorate, but it was M Karunanidhi’s “Free Colour Television scheme” ahead of the 2006 elections that had a pronounced gear-up in the freebie culture in Tamil Nadu. #SarkarVsTNSarkar – What is wrong in criticising freebie culture & on what basis TN Law minister calls Actor #Vijay a Naxalite? Last year Central Ruling govt now State Ruling Govt !!! ADMK Protest at Madurai , Coimbatore, Trichy .. Heavy Police Protection For All Theatres..
#SarkarVsTNSarkar Free promotion started by AIADMK Ministers. Vijay and a r murgadoss sir should place thank you card for them before the start of the movie. Hence it’s happening now !!!! விஜய் தீவிரவாதிகளுடன் தொடர்பு வைத்துள்ளார்- சட்ட அமைச்சர் சி.வி.சண்முகம். What do you think on Internet’s reaction ?? Comment below !! Previous articleAkshara Haasan’s Private Pictures Leaked & Her Reaction Was Heart-Breaking !! Next articleFor The First Time Kohli Responds To The Massive Anger Of Fans Against Him !! Check ! !